With one in four of all full time workers working over 40 hours a week in the UK, the notion of a proper “work life balance” to be able to spend more time with your family, care for children or look after relatives is but an empty slogan for millions of workers. At the same time, millions of part time workers desperately scrabble around, week to week, to find enough hours to work to make ends meet. Increasingly the legal right to “ask for flexible working” is becoming just that, a right to ask and the right of the bosses to tell you to get lost! In particularly, many women are being forced out of work after having a child, unable able to afford child care and unable to get agreement from the employer to reduce their hours. The truth is the current UK law on flexible working rights has more holes in it that a sieve, and gives the employers an easy escape route. That is why the recent deal agreed by the German engineering workers union (IG Metall) for their members to have a right to have a 28 hour working week for up to two years and then the right to return full time work, alongside an inflation busting pay deal, has won widespread international interest. Coming on the back of workers’ action it shows a glimpse of what could be won not by pleading with the employers or asking the EU to do it but by militant industrial national action. The question of a shorter working week, with no loss in pay, is even more valid in today’s world of rapid technological change. The union, with over two million members, launched a campaign for the right to have a 28-hour working week, albeit with reduced pay, and for an 8% pay rise, under the slogan of “more time to live, love and laugh” One union leader said “in the past it was the employers who demanded flexibility now it’s the other way round”. The union targeted hundreds of companies, including some of the big car plants, first with warning strikes and then 24-hour lighting strikes (a new tactic), involving around 930,000 workers. These protests saw a massive participation and real anger by workers; they wanted both a share of their bosses’ huge profits, and a loosening of working hours. When the employers refused to move the unions then threatened to escalate to an all-out strike. The bosses panicked, fearful of the workers’ anger, and called for talks. The 24 hour strikes had already cost the companies’ £200 million in lost production. While the union did not win all its demands, and all the details of the final deal are not fully clear, it did win a 7.4% pay rise over two years, the right to a 28 hour working week, for up to two years, with the right to return to their full time job (unfortunately this was not without loss of pay) and for the reduced hours to be shared out amongst other workers. It is clear that more could have been won as German industry is booming. There is also the danger the bosses could use the deal’s details to impose and increase working hours. 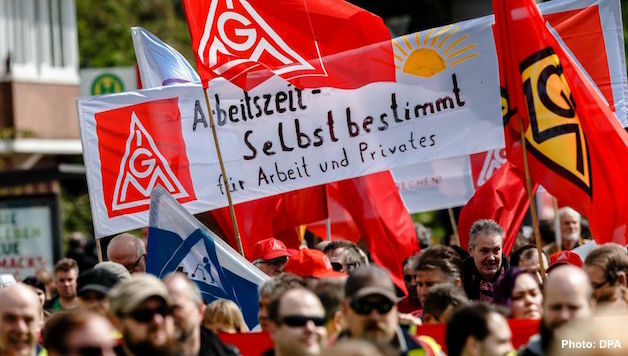 While some smaller employers are unhappy, Dulger, head of the bosses’ association (Gesamtmetall), welcomed the deal, as it enables bosses to increase the working week from the existing 35 hours (in western Germany) to 40 hours. Furthermore, the implementation of some parts of the deal is conditional on company profitability, while other parts are unclear and need to be clarified. Bernd Riexinger, the co-leader of the DIE LINKE (the Left Party), and a former regional union leader, criticised the deal. While the right wing IG Metall leaders made radical sounding statements that recognised that it was the threat of longer strike action that won the deal, one union leader said “it was like a tube of toothpaste – you have to apply pressure from the bottom to force something out of the top”. The majority of the union leaders feared calling further strikes. Unfortunately the overall results are mixed. The wage rise is welcomed, although more could have been won. However the deal does not solve the issue of many workers feeling burdened by pressure at work. It is good that working time has been put on the agenda, but the question now is how to campaign for fewer hours, with no loss in pay. But, showing this issue has different sides; workers have also questioned why families should have the main responsibility for social care, demanding that the state provides support for children, the sick and elderly. There are many lessons for British workers struggling with too much or not enough work, trying to juggle family life and the need to earn a living, and add to this the threat of automation being used to destroy jobs. That is why the British unions need to resurrect the old slogans of a shorter working week, with no loss of pay, and to share out the work. And more importantly, recognise that the bosses will never willingly give it over without a determined fight.